Senior Giavanna Corazza and Junior Rita Jerome received their Girl Scout Gold Award on Monday, May 14th. The Gold Award represents the highest achievement in Girl Scouting, recognizing girls who demonstrate extraordinary leadership through remarkable Take Action projects that have sustainable impact in their communities and beyond. More than 5,500 Girl Scouts across the country design, implement, and complete Gold Award projects every year. Each girl is required to design and complete an 80+ hour Take Action project that will have a great impact on her community. Two of our students have successfully completed their projects and are planning to use what they have learned in hopes of building a brighter future. Giavanna's Take Action project, "Helping Hands for Happiness," was inspired by her firsthand experience of seeing how difficult hospital stays can be for both children and parents. She, along with many other members of the Staten Island community, made over 150 age-appropriate activity packages for children in the pediatric unit and children's emergency department at Staten Island Hospital. Rita focused her project on the sexual assault epidemic plaguing college campuses throughout America. "I was first inspired to complete my project when I joined the Girls Learn International club at Hill and the issue became a topic of conversation." She stayed motivated through the kind words and inspiration of the faculty of Saint Joseph Hill Academy, namely Ms. Paladino, Ms. Mojica, and Principal Mrs. Molluzzo. Pictured above: Rita Jerome (left) and Giavanna Corazza (right) with Ms. Paladino. After spending over a decade being Girl Scouts and working towards their Gold Award, these girls have learned valuable life lessons that will stay with them for many years to come. Rita credits the Girl Scouts organization for giving her the confidence to go out and change the world. "I know now better than ever that I am a capable, independent young woman with a vision and I want to take what I’ve learned to inspire other Girl Scouts and women in my community to discover the leader inside of themselves." Giavanna, recipient of the 2018-2019 Dr. Harry Britenstool Scholarship and this year's Future Woman of Distinction, plans on using the skills learned from her Girl Scout experience in the next chapter of her life at The George Washington University. 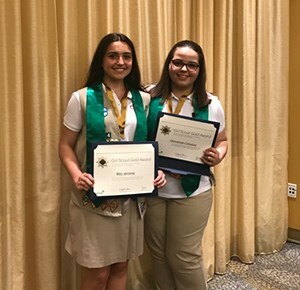 "I look forward to applying the networking, communication, problem-solving, and leadership skills I’ve gained throughout the duration of my Girl Scout experience, especially my Gold Award project, to be a lifelong advocate." Congratulations! We are extremely proud of your accomplishments!